Evotech Performance has been around for a while, producing a range of aftermarket parts from their Lincolnshire base. And they’ve now turned their attention to the KTM 390 Duke. As a smaller 375cc A2 learner legal motorcycle it’s not only a great motorcycle. It’s also one that appeals to younger and newer riders. 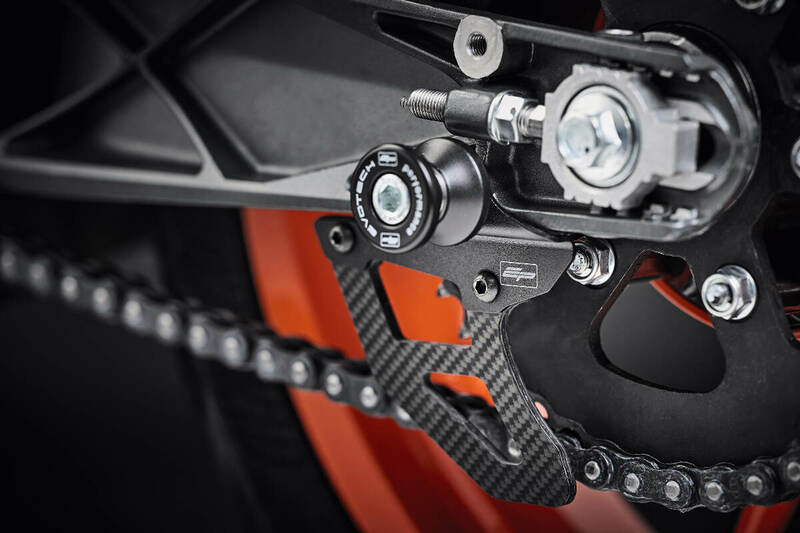 So it makes sense that the new Evotech KTM 390 Duke parts will give the bike more crash protection, as well as looking good. The parts will all fit the 2017-2018 model year, and can all be bought separately as required. And Evotech kit is used by race teams from BSB to MotoGP and the Isle of Man TT, as well as on special projects by the likes of Guy Martin. So you can probably put a fair bit of confidence in it doing the job. 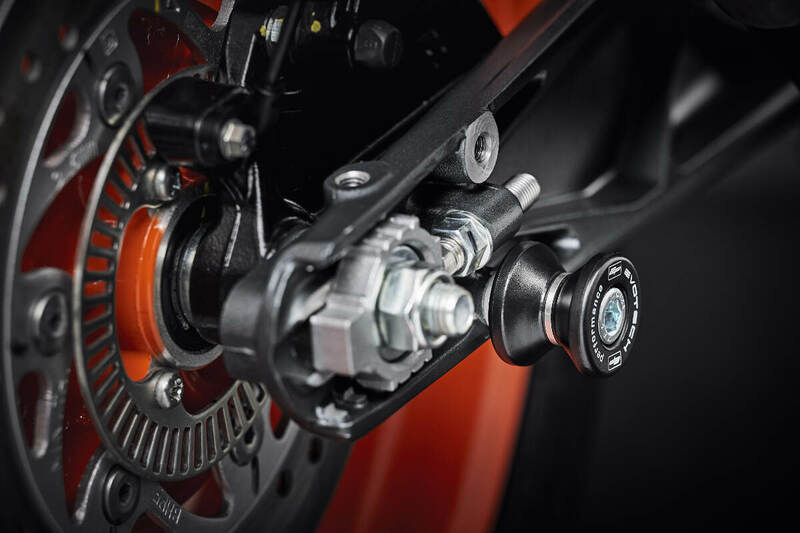 There are actually 8 new Evotech KTM 390 Duke parts and accessories to run through, so sit back and get your credit card out. 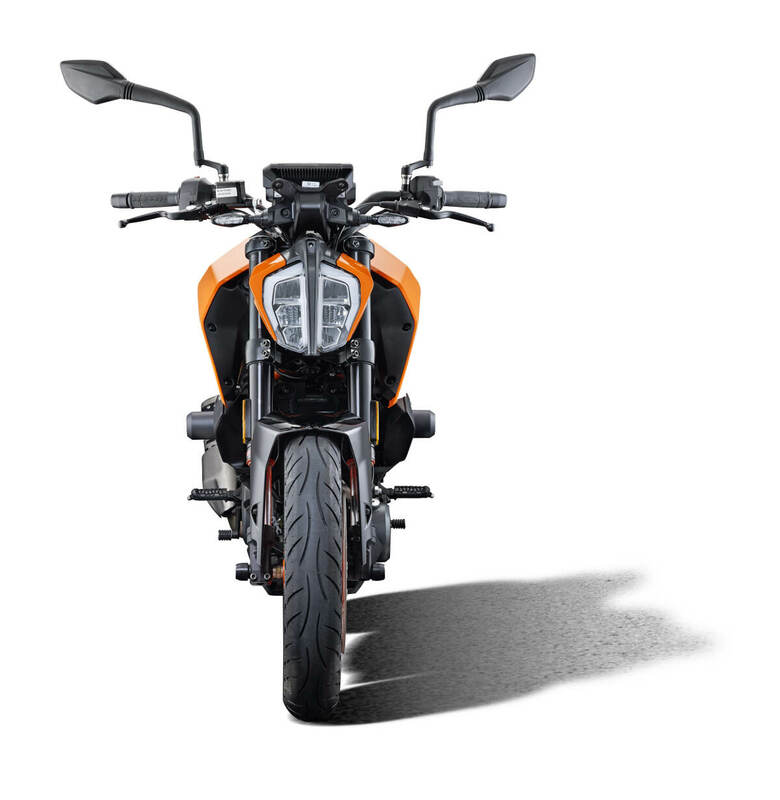 Starting at the rear is a tail tidy for the KTM 390 Duke which has a clean and uncluttered finish. You keep the original license plate light and indicators to make it easy to fit. But the Concealed Designed Wire Technology (CDWT) approach means that you hide everything away, but with additional plate mounts, reflector and LED lights included where international markets might require them. The Evotech Tail Tidy is made from CNC-machined lightweight aircraft grade aluminium with a black powder coated finish. And the result is a weight of 760g. It costs £124.99 with all the required fixings included. The radiator guard will give you protection from debris and damage. But the hexagonal matrix pattern means you still get the best possible airflow to keep things cool. Like the tail tidy, it’s constructed from aircraft quality aluminium and finished in black powder coat with the edges deburred. 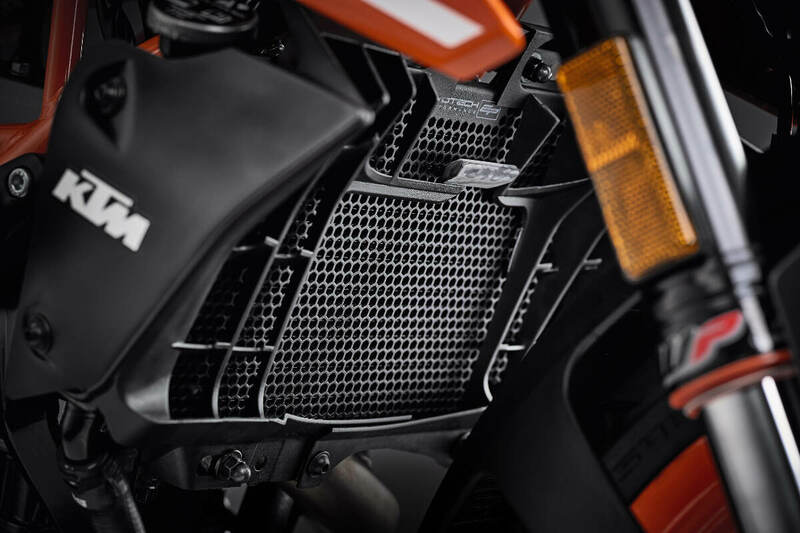 The Evotech Radiator Guard for the KTM 390 Duke fits to the existing mounting points, doesn’t need any modifications, and comes with all the fittings you’ll require. It weighs 120g, and will cost you £54.98. Next up is the Rectifier Guard, which might look pretty similar to the radiator version. That’s because it has the same pattern to let air in while also stopping as much damage as possible. 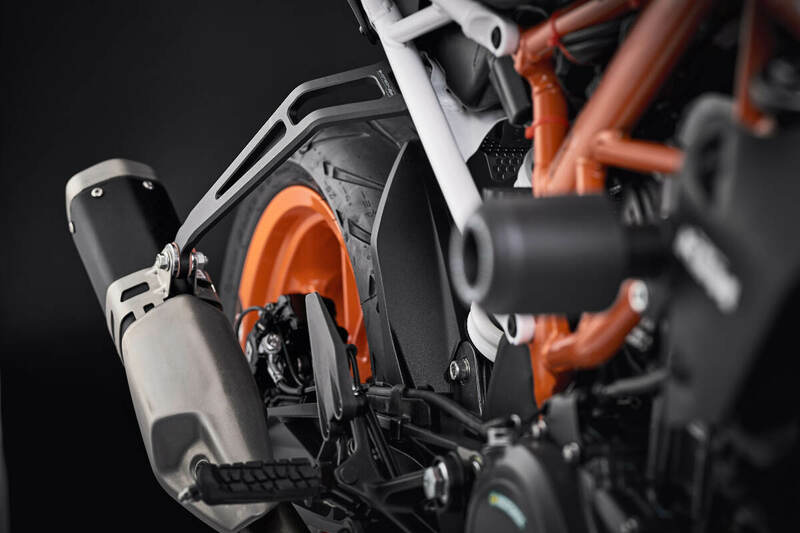 And you’re once again looking at high quality aluminium machined to fit with black powder coating, and no need for modification to the existing mounting points on your 390 Duke. It costs just £29.99, and weighs 80g. And the Rectifier Guard comes with replacement stainless steel fasteners included. It’s a sad fact that newer riders tend to have more accidents. Hopefully most will be minor low-speed incidents which don’t injure more than pride, but can have a bit impact on your bike. 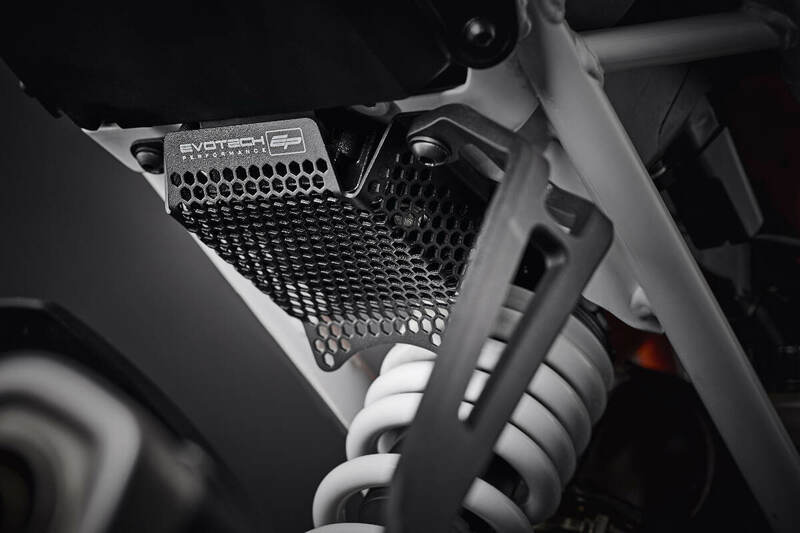 So the Evotech Performance Crash Protectors have an anodised aluminium core, polyurethane washers and injection moulded nylon to protector your motorcycle and bodywork from getting damaged by contact. 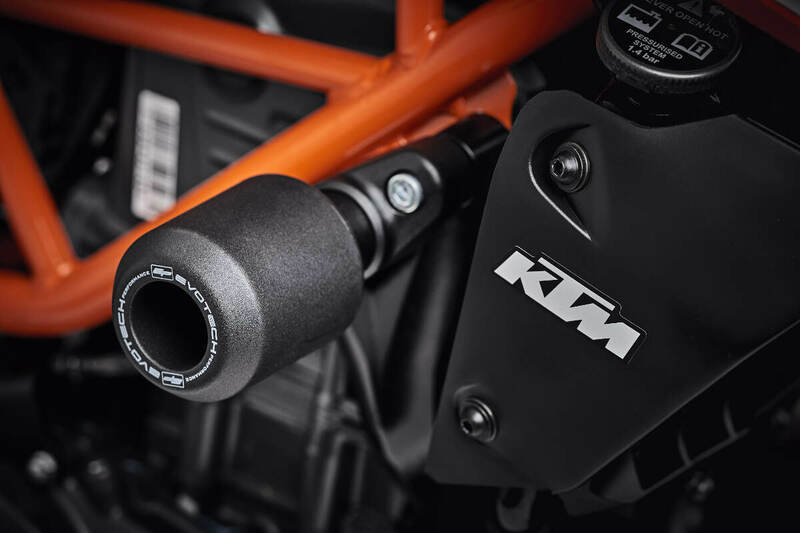 You don’t need to modify your KTM for them to fit, and they come with replacement fasteners with spacers for everything to come together without any problem. They do add 1.38kg of weight, but it’s worth it to save the time and cost of damage, for just £109.99. And if you need individual parts, they’re also available via Evotech Performance. Use the original front fork mounting points to add the high quality nylon spindle protection bobbins. They weight 80g and feature anodised internal aluminium spacer mounts. Subtle and effective, the bobbins will cost you just £25, including the supplied fasteners. Want to add even more style to your KTM? What about a race-style aluminium exhaust hanger which also ditches both of the original pillion footpegs if you don’t plan on letting passengers come for a ride? It’s CNC machined and black powder coated with chamfered leading edges for a factory style finish. To always have an excuse to ride solo, and to get the race look will cost you £44.99, and the hanger has a weight of 240g, which will mean a decent saving once the pillion pegs have gone into the garage or bin. There’s a reason why people use paddock stands, even if their motorcycle came with a sidestand. It can make maintenance a lot easier and safer, as well as keeping your bike stored securely. Balancing a bike on a sidestand to spin the rear wheel and lube the chain only takes one slip to turn into a bit of a disaster, for example. Paddock stands aren’t too expensive, but bikes rarely come with any method to use them as standard. So the Evotech Performance Paddock Stand Bobbins come with mounting bolts to secure the two-piece nylon outers and stainless steel inner sleeve with bespoke spacers. They weigh 120g and cost £25. 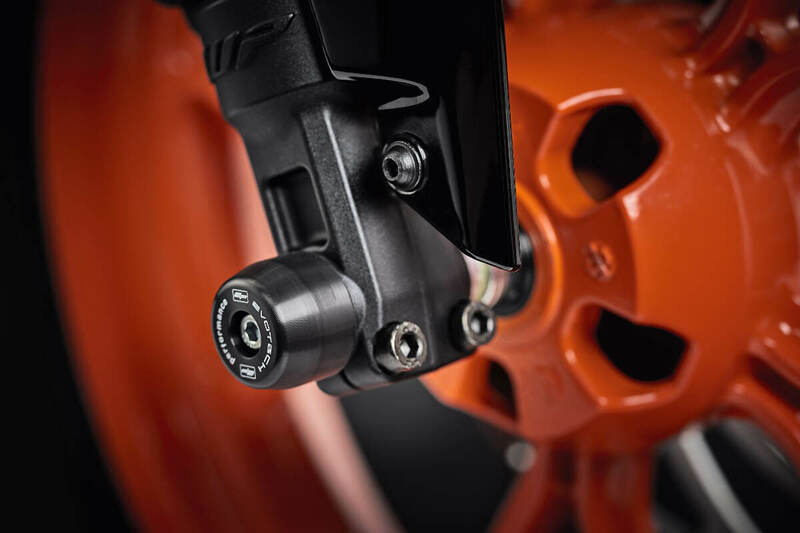 Another part which will make your KTM look a bit more trick, as well as potentially helping safety, the toe guard will reduce the chance of your lower leg coming into contact with the chain and drive line. And it means a carbon fibre ‘shark fin’ profiled guard like racers use, along with the included stainless steel mounting fasteners. The Evotech Performance Toe Guard will cost you £44.99 and weighs 140g. 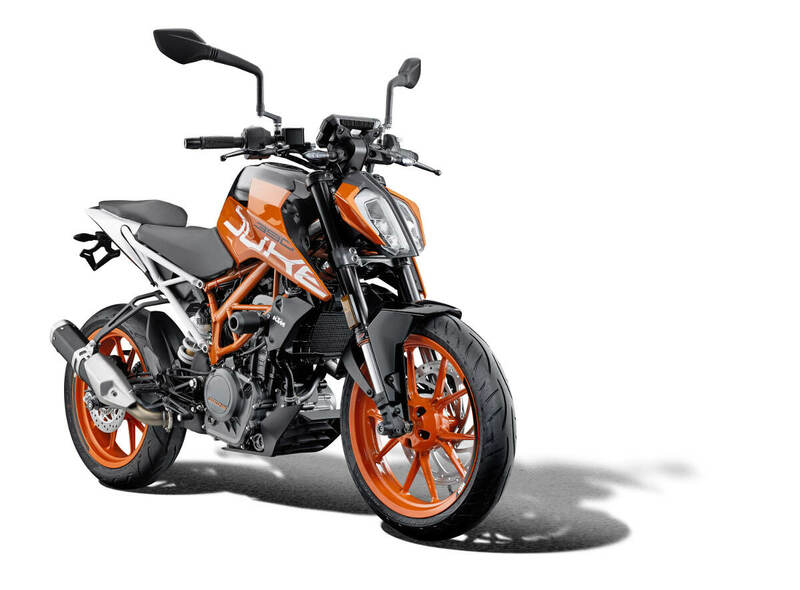 So that little lot will definitely make a difference to how your KTM 390 Duke looks. 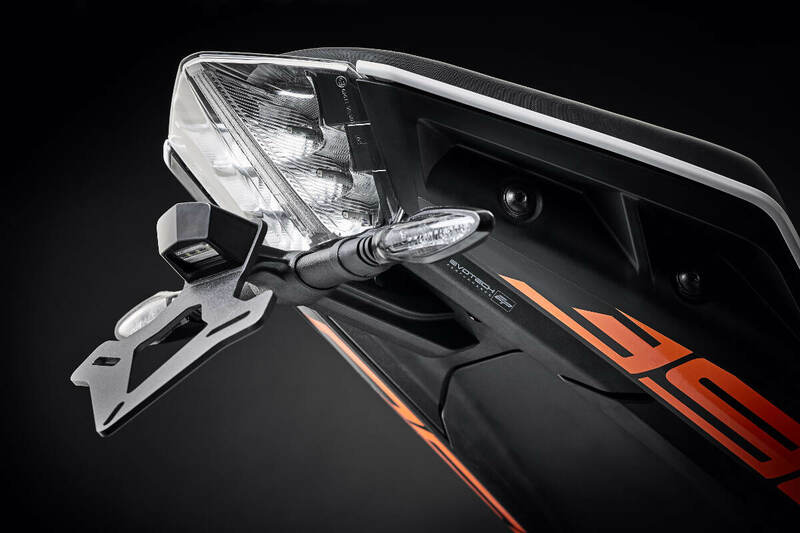 And there are still more products available which weren’t described in detail, such as the Evotech KTM 390 Duke mirror extensions, if you’re struggling to see what’s behind you. They do make the mirrors look more like the antennae of an insect, but taller riders will find them invaluable to keep an eye on following traffic. And the end result of all the Evotech KTM 390 Duke parts is a bit more style, and a lot more crash protection. Which sounds like a decent plan if you want to keep your mini-Duke in good nick. Or take it on track and minimise the risks to bike and rider.